Just like all of Tesla’s other offerings, the Semi is a very quick vehicle. Prior to the truck’s unveiling, Elon Musk noted in a TED Talk that the Semi would be a “very spry” truck that could be driven around like sports car. Musk’s comments were eventually highlighted by the Semi’s specs, such as its 0-60 mph time of 5 seconds flat when launching without a trailer, as well as actual sightings of the vehicle accelerating like a high-performance sedan. Earlier this year, for one, the Semi was spotted performing a seemingly impromptu tire-shredding acceleration run while cruising on an area between Tesla’s Fremont factory and its Palo Alto headquarters. 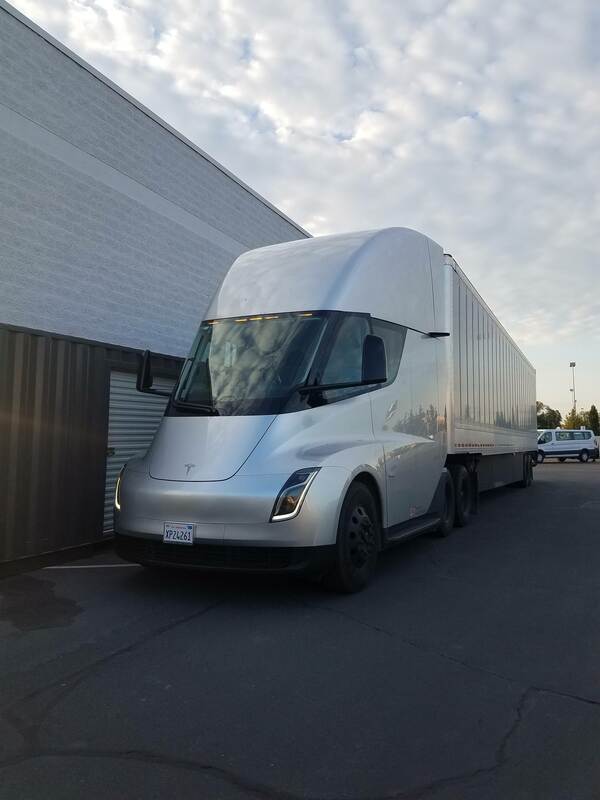 The Semi has since been sighted in multiple states across the US, and during the company’s Q2 2018 earnings call, Jerome Guillen, the former head of Tesla’s truck programs who is now serving as the company’s President of Automotive, pointed out that the vehicle had already been improved since it was initially unveiled. The exact nature of these improvements remains to be seen, but if a video of the Semi captured earlier this month is any indication, it appears that the electric long-hauler has gotten even more daunting and impressive when it performs a full-speed acceleration run. The Tesla Semi was sighted in Salt Lake City earlier this month, and not long after that, the truck visited the company’s office in Draper, UT. The vehicle attracted the attention of members of the Tesla community, including r/TeslaMotors subreddit member u/m3gusta_, who was able to capture the vehicle on video as it accelerated forward while hauling a trailer. The video was brief, but it was enough to show what the Semi looks and sounds like when it is launching with what seemed like the vehicle’s full power. Needless to say, the Tesla Semi’s quickness, as well as the unmistakable, high-pitched, futuristic sound of the truck’s four Model 3-derived electric motors, were nothing short of unearthly. The Semi’s performance, handling, and power were specifically pointed out by professional driver Emile Bouret, a close friend of Tesla chief designer Franz von Holzhausen, in an Instagram post earlier this month. Bouret, who is no stranger to the power and performance of Tesla’s electric cars due to his work since the original Tesla Roadster (he also conducted the test drives in the next-gen Roadster during the Semi’s unveiling last year), noted that the Semi’s “speed and agility” were at odds with a vehicle of its size. Bouret further dubbed the electric long-hauler as a truck that is cool and crazy in equal measure. Over the past month, sightings of the Semi have increased, with the vehicle being spotted traveling across several states and visiting some of its reservation holders like J.B. Hunt, UPS, and Ruan Transportation Management Systems. Tesla’s engineers accompanying the vehicle as it conducted its real-world tests have also begun sharing information about the truck to the Tesla community. During a stop in CO, for example, Tesla engineers shared details on the Semi’s upcoming sleeper cabin, the prototype’s carbon fiber construction, and the truck’s existing 26-camera system. When the vehicle was unveiled last year, CEO Elon Musk noted that the Tesla Semi is expected to begin production sometime in 2019. As noted by Eric Markowitz & Dan Crowley of Worm Capital in a note published after a tour of Gigafactory 1, Tesla is planning on “earnestly” producing the Semi by 2020. Watch the Tesla Semi launch with a trailer in the video below. Do note that this video is best viewed with the sound turned up.